(15Aug08)This issue will take a fresh look at materials. The 1 September issue will repeat the taped seam essay. 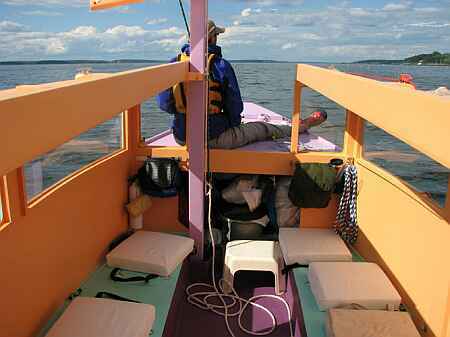 ... will take place at Lake Monroe near Bloomington, Indiana in late September. John McDaniel writes: "Go to http://pwp.att.net/p/pwp-mwmess for more information. Susan and I plan to put BANTY in the water on Friday and sleep aboard a couple of nights. Come join us..... well, bring you own boat or tent... BANTY only sleeps two. The Saturday pitch-in dinner is always good and the campfire chat is even better. This year we'll have a representative from Gougeon Brothers, Inc., manufacturer of WEST SYSTEM® products present on Saturday to discuss epoxy and epoxy products. 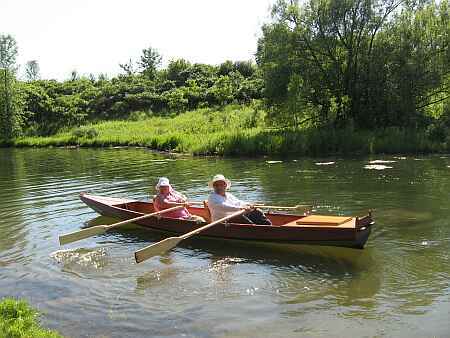 Sunday afternoon we're hosting anyone interested at the McDaniel-Shanklin Donkey Farm & Boat Emporium (Columbus, IN). 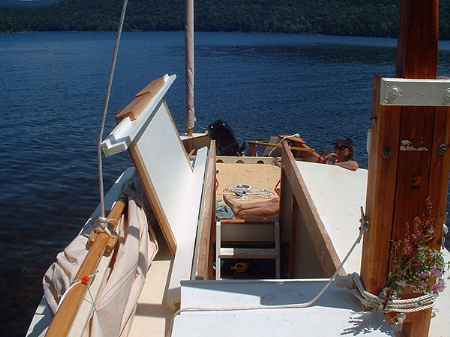 You can check progress (or lack thereof) on our 48' sailboat and enjoy a burger or hotdog." Dave Perrone's delux RB42 goes out for a pull. 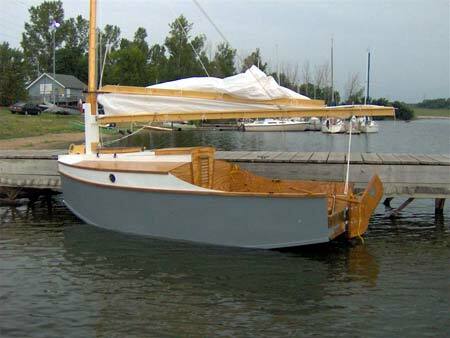 Here is what I suggest about hull materials: if you are a craftsman and are building a show boat, use the best materials. Otherwise use lumberyard materials. 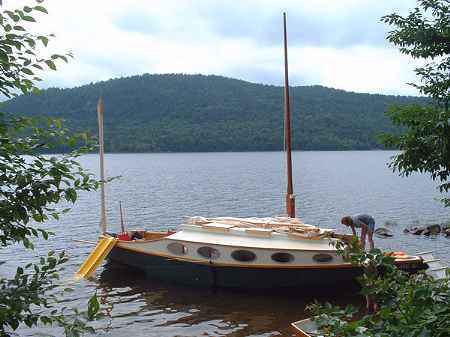 It has been demonstrated that a lumberyard boat will last at least 10 years with minimum care. The premium boat will cost two or three times as much as the lumberyard boat, and is likely to see less use. Then again, I might consider premium materials for a true workboat or a liveaboard boat where hauling out to repair will be a great inconvenience. I am writing this in 2008 after repairing the bottom of my AF4 which was the basis of the last essay written back in 1999. I found the materials available to the average builder change rapidly, much more often than once in ten years. So if the materials I write about here are not available at your supplier, that will be of no surprise. Some new materials are better than the old and some are worse. A general note about plywood is that you must use panels made with exterior glue. It has to be marked thusly on the panel or most likely it is not waterproof. If it is not waterproof don't trust it. I bought some marked "exposure 1" and was told by the lumberyard it was waterproof. But a closer check showed it is not. It is supposed to hang together for a month unsealed as in house building prior to siding or roofing. For a boat it might not do very well. I went back and bought some stamped "exterior" but even then I am keeping my fingers crossed. In the old days "exterior" and "marine" grade panels were said to use the same glue although I suspect the marine grade had glue applied with more care. I have never seen a true "exterior" panel come apart at the glue. By the way, plywood boats seem to always die from rainwater collecting inside. So a boat that sits on its trailer unused is just as likely to rot as one that gets regular in-the-water use. Exterior AC Fir plywood was once available like bread and butter around here. But none of the plywood I bought for the AF4 refit had any markings of wood type. It was all "white" type wood but did not seem to warp like the pine ply available a few years ago. I assume it might have some fir or perhaps spruce or maybe pine I suppose it could be a blend of all of those. The recently purchased panels all seemed to have good plies with almost no voids, as good as the stuff I got in the old days. It comes in a multitude of thicknesses but nowadays it always is 1/32" less than what the lumberyard calls it. So what is called 1/2" is today really 15/32". Real 1/2" plywood was not available there. Normally that is not a problem but it could bite you from time to time. The A face is nearly always plugged or puttied in places, but that is usually a cosmetic problem. The C face always has some holes, seams or knots. The best thing to do when you get a sheet home is to fill the voids with body filler and sand smooth while you are still working with a big flat sheet. The inner core sometimes has bothersome voids. Fill them if you find them. Often they go undetected until you launch your boat. At the void site the face sheets will swell and bubble up. The same thing will happen if the face sheets don't adhere well to the core. You can fix the bubbles even on a completed boat. Use a sharp chisel to open up the swell, cut it away and see what's inside. Don't stop chipping until the void or delamination is totally uncovered. Then you can fill the void to the surface with fiberglass cloth in epoxy or polyester resin, or just plain body filler. Grind it smooth and apply two layers of fiberglass over the repair, lapped about 1 inch over the good wood surface. Fair and paint. On brand new wood I used to make the repair with polyester resin. But lately I've been using more and more epoxy for repairs. Sometimes it takes years for the void to bubble and I've never noticed any genuine harm to come from leaving the bubble as it is. A last note about plywood is to shop around for good looking panels. I suspect they get it in pallets and the quality of each pallet varies a lot depending on which tree got the knife. So you might find a perfect pile of it sitting beside a pile of crappy panels, all for the same price. It pays to look around a bit before buying I think. If you see an exceptional pile, buy it. For framing lumber I use regular soft pine. It is very cheap and easy to work, but not very rot resistant, I think. I use it for oars and spars also. Clear pine boards cost three times as much as common boards and I rarely buy them. Pine is about all that is available here. The yard man told me the best wood is in 2x10's which can be very long. Those boards are huge and you may have trouble handling them. But it would be worth looking into having one ripped to the sizes you need at the yard. Glues have really improved in the past decade. Gone is the powdered Weldwood that was around for decades, not totally waterproof but good enough for a project that would not stay soaked all the time. Instead we have Titebond 2 and Titebond 3 that are much easier to use since they come in squeeze bottles (Weldwood had to be mixed with water) , are water clean up like Weldwood, and are affordable. I think these are the glues to be used in most building but there are exceptions. I've started to use more epoxy as I repair and modify my older boats. Dave Carnell, retired chemical engineer, has led the way to cheaper epoxy and so far hasn't been rubbed out by the Epoxy Mafia. Here's what Dave says. Epoxy resins are all the same except some are thinned. He buys the cheapest. But the hardeners vary a lot. Any will work with any resin (since all the resins are the same, right?). The proper mixing ratio is determined by the hardener's instructions. My latest epoxy purchase was from duckworksmagazine.com. I got 3/4 gallon kit for $50. That came as 1/2 gallon of resin and 1/4 gallon of hardener for a 2:1 mix and a total brew of 3/4 gallon. (The 2 to 1 ratio is easily done by eye. No pumps required. I mark a stick 1/2" from the end and again 3/4" from the same end, and clamp it with a clothespin inside an unwaxed paper mixing cup, with the end of the stick on the bottom of the cup. I fill to the 1/2" mark with resin and add hardener to the 3/4" mark.) . Epoxies come in many flavors and setting speeds. The temperature of you working area can become quite important. By the way, "5 minute" epoxies are not considered to be waterproof. Using the "very fast" in 40 and 50 degree temperatures the epoxy might set about overnight. The "slow" hardener takes a full day to set at 70 degrees. It might be the best choice when working in hot tempearatures. Setting rates are VERY sensative to temperature. Dave has led the way on epoxy fillers, too. That is very important since even epoxy used in a tight wood-to-wood joint needs to be thickened a bit to keep it from running out of the joint. Dave says "pulverized limestone" available at seed stores is the best filler. It must be very finely ground to work smoothly. Sometimes for large fillets I use ordinary sawdust which I "mine" from my bandsaw as a filler. But for general thickening use I almost always use baby powder, which is talc which is powdered soapstone, bought at Walmart in big bottles pretty cheap. Comes with fragrance which stays in the fillet forever and if you cut into the joint years later you can smell it. The old rule on thickening epoxy seems to be mayonnaise stiffness for glued joints and peanut butter thickness for fillets and fillers. In all cases, a wipe of unthickened epoxy ought to be on the wood before the thickened stuff goes on. Epoxy used with fiberglass cloth should not be thickened, in fact that is the case for thinned epoxy. A word about tube type house construction adhesives. Very few are waterproof and I think "water resistant" is not good enough. I have used with success "PL Premium" and PL400. They are marked "waterproof" any maybe they really are as I haven't heard of a failure. I think there are however some issues. One is that the stuff is quite thick, like chewing gum. So getting a thin film of glue is very difficult, but on the other hand if you have gaps to fill this is the stuff for you. Second is that PL doesn't really cure hard like other glues so sanding it smooth just won't happen. I think flexible glues might not work well for some situations like spars. Finally the stuff can set up in the tube without your knowing it including setting up on the dealer's shelf. So you might make an effort to buy it from a supplier who moves a lot of it. For nails, bronze ring nails are by far the best because they're strong, come in all sizes, hold about like screws, and don't mind grinding and sanding. I buy them when I can. They are expensive but I suppose a little boat will use less than $10 worth. 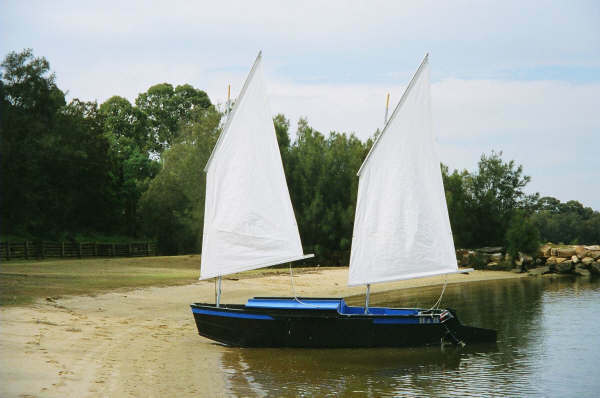 Try jamesbowndistributors.com for these and other true nauticals. Galvanized nails from the lumberyard are fine too, except that you can't sand them or they will rust. But I've used lots of them. Galvanized roofing nails are very good for nailing thin plywood sheets. They can be purchased in different lengths. While you're at the lumberyard, pick up a pound of 1" and 1-1/2" dry wall screws. Get a couple of driving bits for your drill, too. These screws are excellent as clamps. In most cases they require no pilot holes. You can hold two pieces of wood together by hand and "clamp" them very strongly by using a dry wall screw. Sometimes you can preassemble an entire hull this way, take it apart, apply glue, and reassemble it exactly the same as before because the screws always realign the pieces precisely. After the glue cures you can remove the screws and insert nails, non rusting screws, or simply putty the holes. The dry wall screws can be saved and reused. I got a question once about what type of wire to use for wire "stitching" used in taped seam construction. I think almost any type of soft wire is suitable but I prefer .020" diameter stainless steel lock wire available from Wicks Aircraft Supply. For putty I use ordinary two part auto body filler like "Bondo" for about everything. Read the instructions on the can and practice with small amounts first. For fiberglass I prefer getting glass cloth and tape by mailorder (try Duckworks or Raka) although for small projects I sometimes buy the little packs of cloth and resin at the discount store. (By the way, fiberglass "tape" comes in rolls in widths from 1" to about 6". Its edges are treated to prevent unraveling and is thus much prefered for taping plywood seams together. But you could cut regular cloth into strips instead.) If you are using polyester resins for the fiberglass work buy "Finishing" resin as opposed to "Laminating" resin if given a choice. Read the instructions on the can and practice with small amounts first. Do your fiberglass and resin work all at one time. Always sand it lightly after it cures to remove wax and glaze. Yes, epoxy is better than polyester and epoxy is now about as cheap as polyester (back in 1980 I suppose epoxy cost five times as much as polyester thus many old projects were made with polyester). I stopped using polyester resins in 1990 although I still have three boats built before then with polyester resin that show no sign of giving up (stored inside). I use regular house paints, both latex and oil. Latex is very easy to use. Oils are messier to use but, once set, are slicker to clean and can usually be stripped very quickly to bare wood with a torch and knife while latex has to be ground off. I clean the oilpaint brushes with gasoline. Either way, I use two coats of primer and only enough top paint to cover. I prefer regular oil based spar varnish. It won't show dirt or damage like paint so I try to use it on pieces that get dirty or banged up. It touches up very easily. Two coats will protect but three coats are better. Sunlight eats it up and it needs renewing more often than paint. 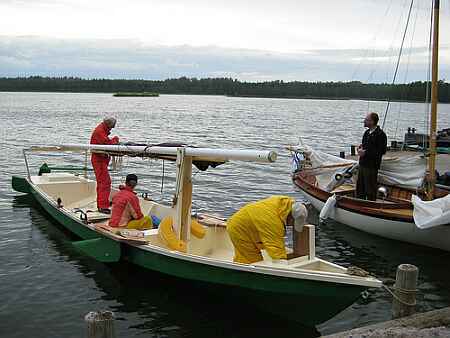 Try the duckworksmagazine.com boatbuilding supply page or the jamestowndistributors.com. I have a Sears bandsaw with a 12" throat. I bought it new in 1972 and it has held up in spite of plastic housings and such. I've got it geared way down. I think the best blade for boaters is a 3/8" skip tooth which cuts fast and straight. 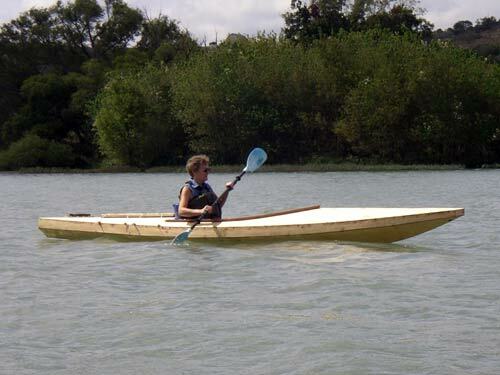 In my type of boats, cutting curves is not the bandsaw's job so much as cuttingbevels. But almost any saw will cut the bevels and taped seam boats in particular don't have many bevels to cut. I have a small portable table saw. Light enough to sit on the floor and move around. For many boatbuilding jobs you might need to rip long cuts and that might be easier to do with a saw that sits on the floor and is easily moved. The very best blades are the thin kerf carbide tipped blades. I also have a regular unmounted circular saw. I use it almost exclusively for cutting plywood. With a good combination blade .set to protrude about 1/4" through the plywood it will zing a clean cut, including making the curves often required, better than a saber saw. But a saber saw will do that job too. The very best blades are the thin kerf carbide tipped blades. I have an inexpensive saber saw with a fine tooth blade for cutting access holes, limber holes, etc. It can also be suitable for bevel cutting in lieu of the bandsaw, although it's tough to get a straight cut without using a guide. You can smooth up the cut with a belt sander. I think the hand held belt sander, 3" wide belt, is fabulous. 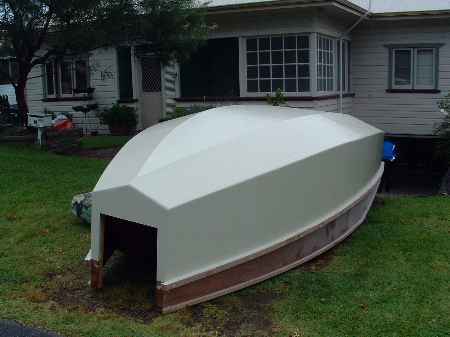 I built my first boats without one so I know. Use 60 grit belts for all your finish work, if not all work. I have an orbital sander left over from the old days but never use it. One other sander I do find very useful is a 5" rubber disk set in a 3/8" drill. This is especially good for feathering out fiberglass work which will often "load up" and ruin a sanding belt. I buy 60 grit pads meant for automotive work. Use a light touch and practice with it because it can really cut. I've also used 20 grit disks, which appear to have small rocks as cutting agent, for really coarse cutting with great satisfaction. I have been getting the best disks at the NAPA store. My only drill is a standard 3/8" reversible job. I have a coffee can full of assorted drills. I don't hesitate to run out and buy the right sized drill bit for the job and usually buy two if it's a small bit. Actually only a few basic sizes are required. Keep two driver bits for sheetrock screws on hand. That's it for power tools. But I would say you could get by with a circular saw, a saber saw and a drill. Boats were invented long before power tools but I guess the old builders had bigger muscles, more time, and sharper edges. You often need a saw for cutting sticks to exact length. The bandsaw is good, the saber saw OK, a fine tooth hand saw works, but a hacksaw with a regular metal cutting blade is what I use the most. To tell you the truth, it is often the only handsaw I use on a boat. I have only one plane - an ordinary Stanley hand plane about 12" long. I don't use it very much but marvel at what it can do when properly sharpened and set up. A half round rasp will work miracles sometimes. I keep a couple of ordinary claw hammers near. You will often need a backup block for driving nails into light structures. A lead or steel block, about 5 or 10 pounds, is ideal. A small sledge hammer works fine. Cormorant is the largest boat I've ever designed. I always warn folks to think twice and three times before building a big boat because you can buy a good used glass boat for less, maybe a lot less. 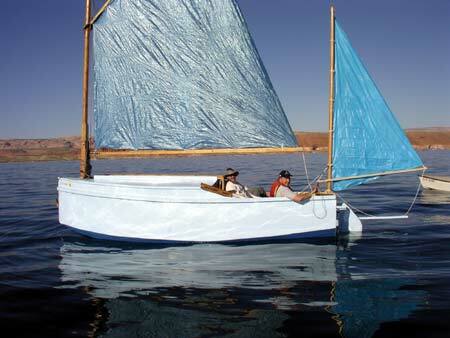 But a homebuilt boat can have features that aren't available in a production boat and so it is with Cormorant. This one is really a 20% enlargement of Caprice. Like Caprice, Cormorant has water ballast, over 1000 pounds of it. Total floating weight with family is going to be up to 4500 pounds. You don't tow a boat this large behind a compact car but I think towing this sort of weight is common today, all done with expensive large trucks I'm afraid. 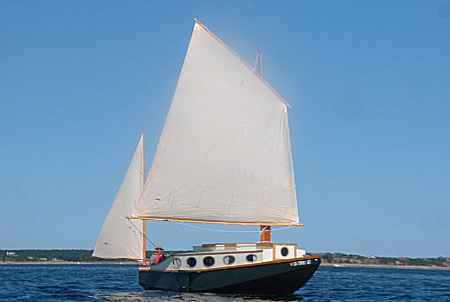 "We had an amazing time living aboard Cormorant (christened "Sea Fever") in Provincetown harbor for 5 days. The tide there was rising and falling about 12 feet a day with the full moon. 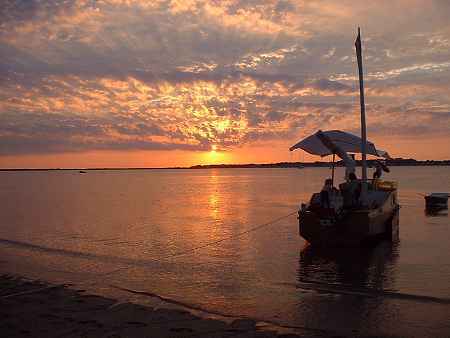 We'd be high and dry up on the beach for breakfast, swimming off the boat at lunchtime, walking the flats again by dinner. It was a blissful time for me and my wife and two girls. We moved around, took little sails here and there across the harbor (West End to Long Point, then to the lighthouse, then to the East End, etc.) 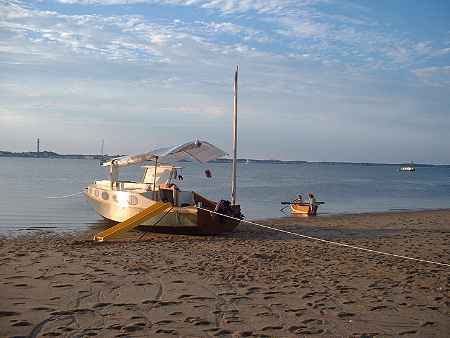 anchoring here and there, usually just running it aground as the tide allowed and staying for a while. Many shells were collected, and tidal pools investigated. Of all the harbors I've ever seen, it is the most alive. It's a couple of miles across and fresh sea water flushes the whole place twice a day. The number of snails, clams, crabs, fish of all sizes, mussels, eelgrass, etc. was just mind-boggling. On high tides I'd go spearfishing (many attempts, no luck) where at low tide I'd been walking around. We rigged a 8' x 15' white tarp with tent poles running crosswise as a canopy over our cockpit and hatch, supported along the mast folded down in the tabernacle, so we could escape the mid-day sun. Most days were hot and humid and mild, with only gentle winds. We rode out a nighttime thunderstorm with no trouble, just stayed up and watched the lightning. 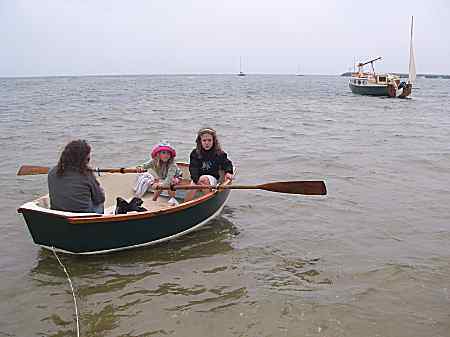 We attended a few wedding-related events, just walking ashore for one party, and for the wedding itself we returned late at night and rowed our dinghy out to the boat, our sleepy children just awake enough to get themselves aboard. For our last two days we gave up the shallow-water life and sailed from P-town down to Wellfleet, about 7 miles, surfing along on gentle 3-foot waves with a following wind. We beached the boat at Great Island, walked the beach, had a picnic dinner, swam and played, spent the night, and left the next morning at 6 a.m. to beat the falling tide. Our weather radio mysteriously quit working that morning, so all we had was the prior day's forecast of 10-15 knot winds from the SW. The wind had shifted into the west during the night, so we had to beat out of the harbor, and once we turned north to return to Provincetown, huge rollers were coming in off the bay, more or less directly into our port side, lifting us, rolling us, occasionally breaking and spraying water into the boat. We stayed well offshore to avoid the breakers in by the beach -- but with the falling tide it seemed that we needed to be nearly a mile out. It went from exhilarating to worrisome to mildly terrifying as we neared P-town and the wind kept picking up, past 20 knots to 25 and higher in gusts, and the waves just kept growing. The swells were in the 8-10 foot range, with a high percentage of them breaking at their tops, whitecaps everywhere. But bless this boat! With its 1000 lbs. 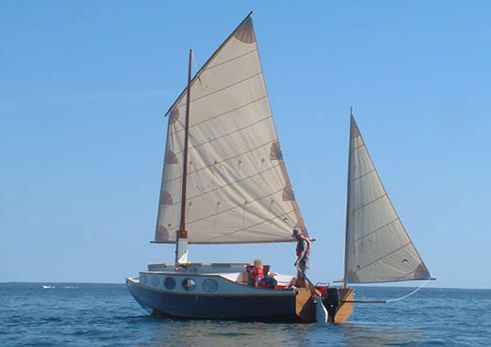 of water ballast, and the leeboard mostly up, we were able to bob and roll and slide over nearly all the swells. The worst of them were very steep and threw us sideways, maybe tilting us to 40 or 45 degrees briefly. We had two reefs in the main and the mizzen rolled down to about half-size, and still we blasted along on this nasty rollercoaster of a beam reach. It was the sort of trip that would be scary fun if it was just you and a buddy, but it's awful when you have your loved ones aboard, and you wonder who might get thrown overboard, and how you'd managed a rescue in the rough conditions. Anyway -- the white knuckles got to relax as we finally made it past the P-town breakwater, and with great relief ran her aground out on the flats. The gale (or near-gale) continued to blow all day, kicking up 3 and 4-foot waves even in the protected areas of the harbor. The only boats we saw going out were an 80-foot schooner and a big whale-watch boat. A lobsterman we talked to later said he'd stayed in as it was too rough to check his traps. We had a hell of a time taking the boat out and getting her on her trailer for the trip home -- but all worked out in the end, with the assistance of some very kind strangers; and I'm left with the memories of incredibly happy days. -- And an incredible boat. P.S. 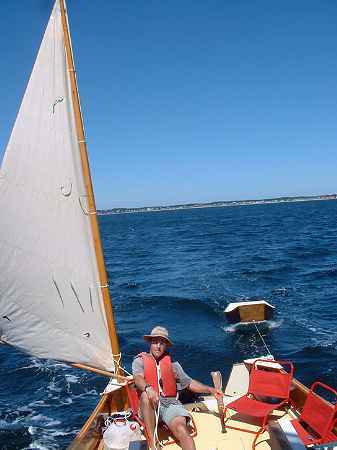 Jim -- I should also mention that on Sunday afternoon as we turned the corner from our run down to Wellfleet to the close reach upwind toward the inner harbor, the boat just drove perfectly. It seemed we made 40 degrees off the wind. That maybe wishful thinking, but it was an angle far better than I'd imagined a lugsail could manage. It was a joy to sail, in all conditions. My hat is off to you. P.P.S. The number of people who came over to admire the boat and exclaim at its uniqueness, its coolness, its obvious functionality -- well, they were beyond count. " Plans for Cormorant are $60 when ordered directly from me.